New Bookshop - an update. You want to see some pictures of the new shop? Here's what it looked like when we got it. Shame there wasn't electricity. And who's that guy on the right of the picture. He looks dangerous. Well, it's been a week since we got the keys and this is what it looks like now! Electricity! and that guy has been replaced by bookcases. It's been a busy busy week and we're really pleased how things are going at the new shop. We had a few problems with plumbing. No water/ No hot water/ boiler makes the sound of a screaming goat. Andy Hollings - totally unstaged. Andy fixed all these problems, replaced bad stuff and made stuff nice. And what a reasonable price! 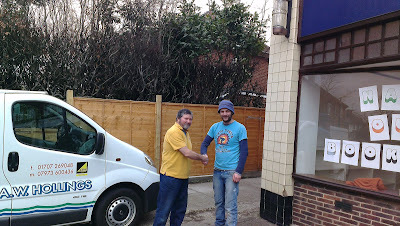 If you need a plumber, and you're in the North Londonish area, then I suggest you call Andy. His number is on the van. We've had some great suggesitons for our "name our bookshop" competition. We've had about 50 entries so far, and there's still over a week to go until the competition ends. Next, we should probably think about putting stuff on the shelves. Suggestions most welcome. When my little boy Ollie was born, my family and I soon realised that living in a 1 bedroom flat with 2 children was a huge struggle. So, we looked for something equally cheap and a bit bigger to move into. 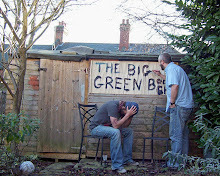 Sadly, because I co-own the Big Green Bookshop, the mortgage companies were unwilling to offer us a mortgage. Small businesses/big risk etc. So we decided to rent our flat out and to find a place to rent ourselves. 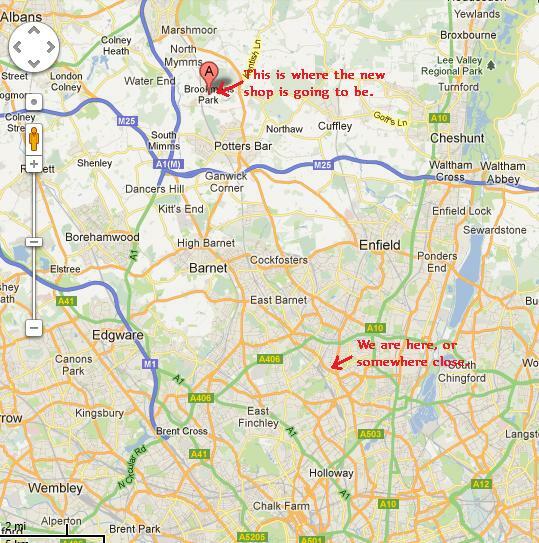 Which is how we found Brookmans Park, the place where we're going to open our new shop. 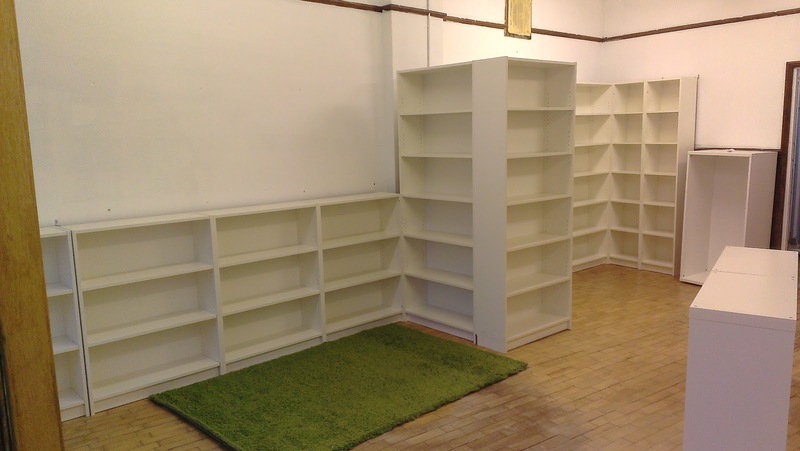 Anyway, the lovely tenants who are currently at our flat are moving out on April 20th, and I thought it might be a good idea to put something on our blog, in case there were any readers who were looking for a place to move to. Below are all the details, and if you do know anyone/couple who may be interested, please get in touch. Available unfurnished £220 per week, subject to contract. OK. What are we going to call the new shop? Well, why don't we let someone else choose for us. If you want to get involved (any age welcome), you can email us with your entry at enquiries@biggreenbookshop dot com, or pass it onto a local school or tell your friends. Well you can work it out can't you? 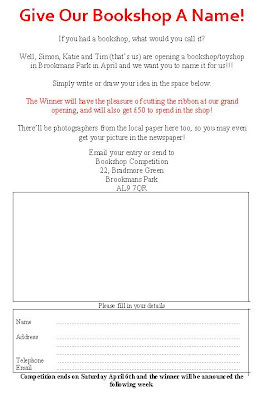 We've spoken to all the local schools and the local newspaper and they're all going to get involved too, so hopefully we'll have some interesting entries. 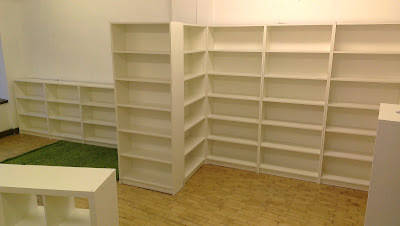 Since we announced that we intended to open a new bookshop, back in November, we've kept rather quiet about it. This, as you may be aware, is not our style at all. Usually, we like to shout very loudly about everything we do. However, because of the nature of the transaction, we thought it best to wait until we'd actually got the keys before shouting loudly about it. OK, here's a quick recap. 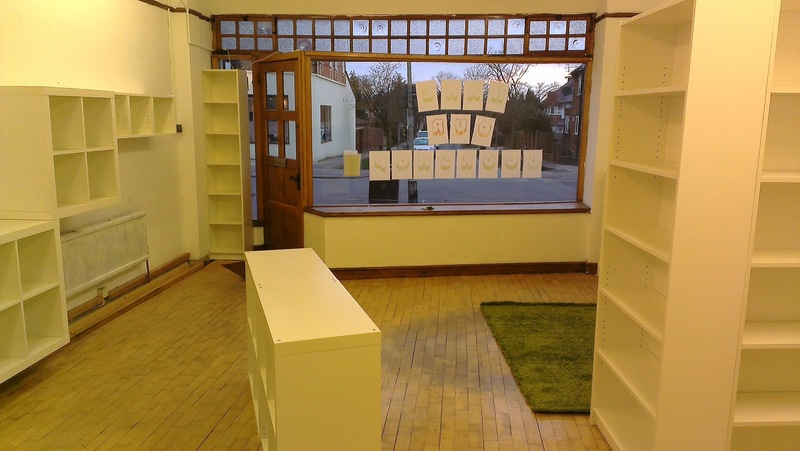 We're opening a new bookshop/toyshop in a small village in Hertfordshire called Brookmans Park. The bloke who works at the ticket office at Brookmans Park Station is called Keith. He is a lovely man. 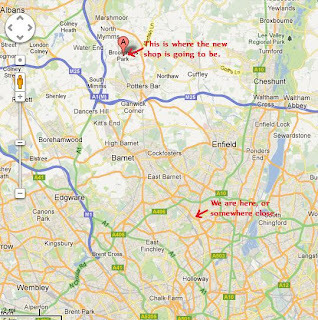 Tulisa has recently moved here. Rumour has it that Miss Muffet (the tuffet person) lived in the area in the 16th century. One of the main roads in the village is called Moffat's Lane. It is 22 minutes on the train from here to Finsbury Park. Tracey Thorn was born in Brookmans park and used to have a Saturday job at the Post Office. Michael, the butcher sells the most magnificent lamb chops. 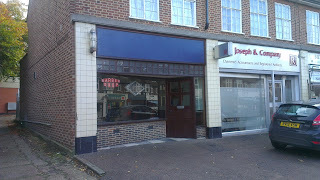 In the village are 2 Indian Restaurants, 2 Chinese Restaurants/takeaways a fish and chip shop and a kebab shop. The kebabs are excellent. One of the most popular shops in Brookmans Park is a dog grooming parlour called Groomers on the Green. 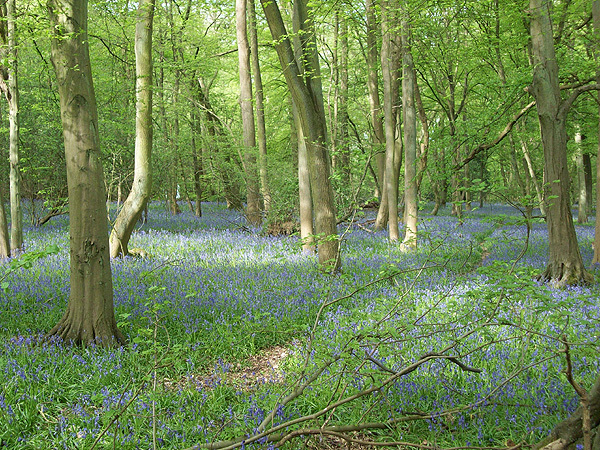 There is a woods nearby called Gobion's Wood. 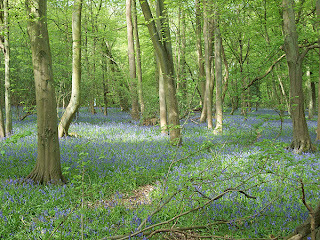 Every year there's an incredible carpet of blubells there. 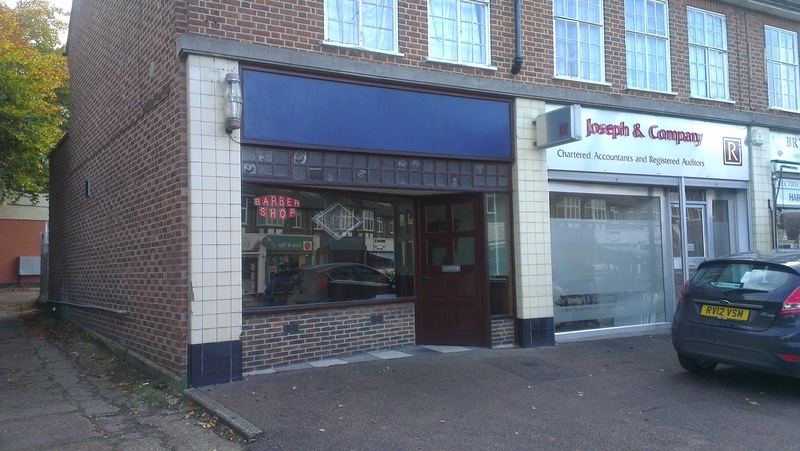 A commercial property became available, which looked interesting. 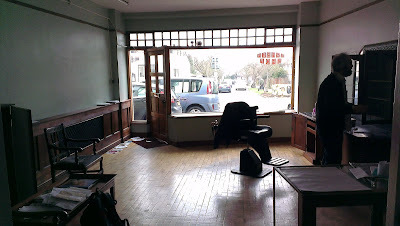 It was originally a barber's shop, and the guy who looked after it wanted to move abroad. We looked at the figures and thought there might be a possibility of us taking it over, so negotiations started. That was back in November. Sadly, negotiations fell apart and we were left with no option but to pull out of the deal. Things, however changed once again when the property was vacated and the landlord was still looking for someone to move in. And after about 10-11 weeks, today we have picked up the keys to this lovely little property. 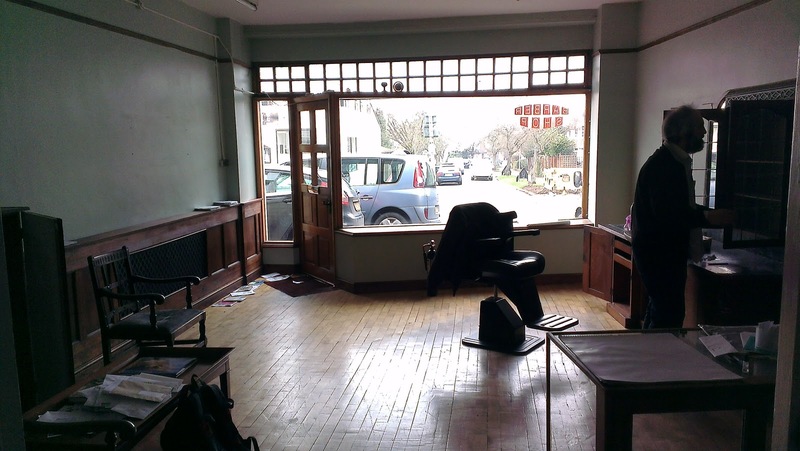 There's a lot of work to do and we have to find tenants to the 2 bedroom flat above the shop (only £725 pcm, easy access to central London), but it is now a reality. We are going to open our second bookshop. It's going to be a children's bookshop and toyshop and our philosophy to how we run this shop hopefully follow the same pattern as our shop in Wood Green. 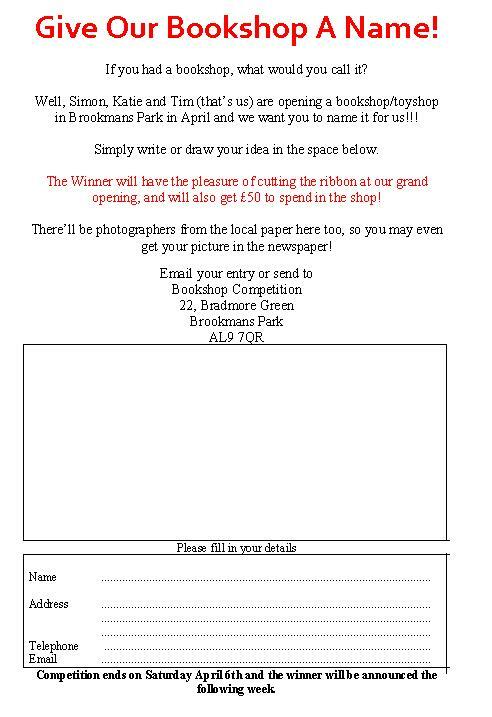 The aim will be to create a community space that Brookmans Park will be proud of. To work with the local schools and the council to get young people excited about books and reading. We can't afford to open the shop (we've had to borrow a bit of cash to help us do this), but at the same time, the opportunity was too great to miss. We'll shortly announce a "Name the Bookshop" competition, which you're all more than welcome to enter, and when I have my phone back from the phone hospital, I'll take some shots of the inside of the property to give you a better idea of what it looks like. NB. A message to all children's publishers and toy manufacturers. Yes, we'd love you to send us lots of free stuff, that would be lovely. We are incredibly excited that the amazing Lauren Oliver is visiting the bookshop as part of her very short visit to the UK. Lauren’s one of the worlds’s best selling Young Adult authors and her Delirium series is soon to be made into a TV series in the US. The Delirium trilogy tells the story of a society where love has been considered a disease and everyone has to go through a special treatment on their eighteenth birthday to be cured of the illness. However, the book's main protagonist, Lena, meets someone who shows her that not everything is as it seems. The final part has just been published and it has smashed into the New York Times bestseller charts. Lauren will be visiting one of our local schools with us and after that coming back to the Big Green Bookshop to sign copies of her books for her fans. If you can't make it to the shop, Lauren has kindly agreed to sign & dedicate any of her books for you. We can send them to you POST FREE anywhere in the UK. This is very very exciting and we're really grateful that Lauren can spare some time in her incredibly busy schedule to come and visit the shop. We are delighted that Joseph D'Lacey is joining us to celebrate the publication of Black Feathers, his extraordinary new novel. I was very lucky to be sent a review copy of this by the publishers, Angry Robot. It's a beautiful combination of folklore, fairytale and dark apocalyptic fiction. Set over two very different time periods, one modern day, the other generations into the future, it follows the journeys of Gordon and Megan. Although there are hundred of years separating them, both are searching for the elusive Crowman. Some say he will bring destruction to the world, others say he is the planet's saviour, but all Gordon and Megan know is that they must find him. The book's a real treat, and it's definitely the most accomplished of Joseph's novels to date (and I've read them all). If you haven't read his stuff before, this would be a wonderful introduction. Joseph's a great storyteller and this shines through in Black Feathers. So come along and join Joseph on April 5th and meet one of my favourite authors of all time. It's FREE and there will be refreshments aplenty. If you're unable to make it and would like a signed copy, it's available to pre-order here. The last Wednesday of the month is the official new date for our Bookswaps, so you can block out your diary for the rest of the year. Hosted by the Great Northern Railway Tavern on Hornsey Road, this is a more informal type of literary event than you may be used to. They've proved extremely popular, and that's hardly surprising as we proudly prestent to you some of the best contemporary writers out there. 1. Bring along with you a book which you like enough to recommend but are prepared to swap for another. 2. Enjoy a delicious buffet provided by the Tavern. 3. Have a drink, sit back and enjoy a great evening of fun. Matt's a brillaint author and journalist who's written a number of bestselling books. His first novel The Last Family in England, tells the story of Henry IV part 1, with dogs. It was a huge bestseller. He's gone on to write children's novels Shadow Forest (which won the Nestle Childrens Book Prize) and its sequel The Runaway Troll. The Radleys, which was published in 2010, is a brilliant take on modern day vampire novel and highly recommended. Life with the Radleys: Radio 4, dinner parties with the Bishopthorpe neighbours and self-denial. Loads of self-denial. But all hell is about to break loose. When teenage daughter Clara gets attacked on the way home from a party, she and her brother Rowan finally discover why they can't sleep, can't eat a Thai salad without fear of asphyxiation and can't go outside unless they're smothered in Factor 50. With a visit from their lethally louche uncle Will and an increasingly suspicious police force, life in Bishopthorpe is about to change. Drastically. His new book, The Humans, wil be published just before the Bookswap. Andrew is the author of an extraordinary new book, which I have had the fortune to read, called A Carnival of the Flesh. Published by Guerilla Books, a new exciting small press, it tells the story of a travelling freak show in the early 20th century, who are marooned on a desolate island. At first the exhuberance of freedom is intoxicating for this motley cast of misfits, but once the wine runs out things start to go downhill fast. The story is narrated by Dirty Boy, who's lived in a glass jar since he was six years old, and who has to be carried or rolled everywhere. Oh and the cast list is something else. There is (among others) the vile leader, the Brigadier, Cedric the dwarf, Two Smiles Madison, Ruby the Hermaphrodite and Chutney Daniels, so named after his tangle with factory machinery left him resembling the messy foodstuff. Andrew's imagination is something else and it's hard to compare this book with anything I've ever read. It's funny, horrific and magical and I was very keen that Andrew came along to the Bookswap so that you could hear more about it. It's a truly beautiful looking book too. As ever with the bookswaps, tickets are just £5 and this includes a delicous buffet served up the the Great Northern Railway Tavern. This promises to be a really fun night. and tickets are available here. We hope you can make it. Ben Fountain, author of Billy Lynn's Long Halftime Walk, in Conversation with Sam Jordison. The Big Green Bookshop is delighted to welcome US multi award winning novelist Ben Fountain to the shop for a very very special evening. Ben's latest novel, Billy Lynn's Long Halftime Walk, is an incredible modern take on the war (or anti-war) novel. Nineteen year old Billy Lynn return's home a hero, after he and his troop are filmed defeating Iraqi soldiers in a vicious gun battle. The video goes viral and the Bush government see Billy as a marketing dream. He and his fellow soldiers are sent on a nationwide victory parade, where Billy mixes with the rich and the famous, and has to cope with the sudden celebrity status that has been thrust upon him. It's a magnificent portrait of a reluctant hero and an incredibly important novel about the modern world that we live in. The book, understandably won The National Book Critics Circle Award and was finalist in the national Book Awards and the Los Angeles Times Book Prize. Ben is over in the UK for a very short time to coincide with the paperback launch of the book on May 16th, and we are over the moon that he's coming to the Big Green Bookshop whilst he's here. We are also very fortunate to have Guardian book critic Sam Jordison here too, who's kindly agreed to interview Ben on the evening.There will be a chance for the audience to ask questions too and Ben will be happy to sign copies of his book for you. Tickets for this very special evening are just £3, available here, and refreshments will be provided. Please book early as tickets are likely to sell out very quickly. If you're unable to make it, but would like a signed copy, the book is available to pre-order here. WE offer FREE P+P. Death at the Palace by Matt Baylis is the first of a new crime series featuring Rex Tracey, a (very) local newspaper reporter. Rex is still coming to terms with the end of his relationship with his Lithuanian girlfriend Milda when a series of assaults on young women take place in Alexandra Palace. He's got other concerns, not least an anti-immigration group run by Keith Powell spreading hate across his beloved Haringey. And when Rex becomes a suspect of the assaults, he's forced to search for answers himself. Amongst the tea-houses and squats, the yam shops and tower blocks of this little-glimpsed, forever-changing part of London, Rex unearths a trail of secrets and falsehoods, from corrupt police to illegal factories. This is a fabulous page turner, that'll keep you guessing until the last page. It centres around Wood Green and Matt has really captured the spirit and atmosphere of the area. This is a book we're really going to get behind and we hope that you support it too. This is Matt's third novel (he's also written Stranger than Fulham and The Last Ealing Comedy) and we're really delighted that he'll be here to read from and talk about the book and answer any questions you may have. The book is available in store at just £6.99. This is a FREE event and refreshments will be available. Please let us know if you're going to attend so we can put you on the list. Haringey is blessed with literary talent and so we though that we should celebrate this by holding a special Big Green Bookswap. Hosted by the Great Northern Railway Tavern on Hornsey Road, this is a different kind of book event, so expect the unexpected. 2. Enjoy a delicious buffet. "Single mother Callie has come to rely heavily on her best friend Suzy. But Callie suspects Suzy's life isn't as simple as it seems. It's time she pulled away - going back to work is just the first step towards rediscovering her old confidence. So why does she keep putting off telling Suzy about her new job? Suzy and Callie live close to each other on a typical cramped, anonymous London street. Neighbours seem to move in, and move on, before you have even learned their names. Callie's increased sense of alienation leads her to try to befriend a new resident on her street, Debs. But Debs is anxious, odd. You wouldn't trust her with your child - especially not if you knew anything about her past. A brilliant and chilling evocation of modern life, The Playdate is a real talking-point book for mothers everywhere." Her new book, Accidents Happen, is due out in April. Kate Parker has had so much bad luck in her life, she's convinced she's cursed. But when she tries to do her best to keep herself and her son safe, people tell her she's being anxious and obsessive. Just when her life starts to spin completely out of control, an Oxford professor she meets offers to help. But his methods are not conventional. If she wants to live her life again, he will expect her to take risks. When a mysterious neighbour starts to take more than a passing interest in her, Kate tries to stay rational and ignore it. Maybe this, however, is the one time Kate should be worried. Andrew is the author of the award winning On The Holloway Road. Unmotivated and dormant, Jack is drawn into the rampant whirlwind of Neil Blake, who he meets one windy night on the Holloway Road. Inspired by Jack Kerouac's famous road novel, the two young men climb aboard Jack's Figaro and embark on a similar search for freedom and meaning in modern-day Britain. Pulled along in Neil's careering path, taking them from the pubs of London's Holloway Road to the fringes of the Outer Hebrides, Jack begins to ask questions of himself, his friend and what there is in life to grasp. Spiting speed cameras and CCTV, motorway riots and island detours, will their path lead to new meaning or ultimate destruction? Callum is the author of House of Dreams, a novel about the horrific possibilities of reality TV. Tyler Thoreau’s lifestyle has been spiraling out of control and when he pushes a make-up girl off the balcony during a recording of his breakfast show Live and Direct, he needs to make a speedy exit. Serena, his producer, packs him off to her family’s cottage in a sleepy Sussex village for some chill out time under the watchful eye of her strange but wise younger brother, Yves. Tyler settles into the slow rhythms of country life and even learns how to turn off his phone. In spite of the rampant industry gossip about his increasingly psychotic behaviour, an extraordinary offer to host a new reality show, House of Dreams comes out of the blue and it is an offer that Tyler finds irresistible, despite the advice of his friends and Panopticon Productions’ veil of secrecy about the exact format of the show. With the backing of a covert, new government department, ‘houses’ set up all over the country and contestants far more numerous than other rival shows, House of Dreams promises to take the Big Brother mould to its ultimate conclusion. Tickets are just £5 available here which includes the buffet. These bookswaps are a lot of fun and this is a fantastic opportunity to meet some of our best local authors. Hope to see you there. No, of course we're not. As well as the Music Jam tonight and Book group tomorrow, we're doing some school visits with authors, we have some classes coming to the bookshop, we're going to announce the official title of the Wood Green Literary Festival and we may even get the keys to our new shop! And LAUREN OLIVER is coming to the shop next week too! A reminder that tonight is the second of our music jam nights. Come along, bring an instrument, relax and have fun. This month the group discusses A Clockwork Orange by Anthony Burgess. Come along, it’s free and there’s always a lively discussion. We are incredibly fortunate that the amazing Lauren Oliver, one of America’s biggest Young Adult authors, is visiting the bookshop on March 19th 2013 as part of her short visit to the UK and will be appearing at one of the local schools. After her visit to the school, Lauren will then return to the Big Green Bookshop at 12.30pm to sign copies of her books for her fans. Copies of the following books are available. These can be ordered online or over the phone. Our hosts tonight are Choc-Lit who publish a delicious selection of romantic fiction for women. Quality stories with a romance at their heart. You will have a chance to listen to two of Choc-Lit's authors at the shop, whilst enjoying a delicous selection of chocloates provided by the publisher (and wine provided by the bookshop). Henriette Gyland's debut novel Up Close, transposes the wintery palette of popular Scandinavian crime dramas to the North Norfolk coast. Chosen as December 2012 Debut Book of the Month by Lovereading and compared favourably to Nora Roberts by The Bookseller, Up Close is a sinister thriller and dark romance that promises to keep you turning pages well into the night. Christina Courtenay is an award-winning author of historical romantic fiction. Growing up and traveling extensively in the far east has had a strong influence on Christina's brand of adventurous tales about women who crossed cultures, continents and oceans in search of family, home and love. Her latest book, The Gilded Fan, is about Midori, the daughter of an English woman and a samurai warlord, who is forced to leave Japan and sail for Plymouth to seek out distant family she thinks of as barbarians. You will have an opportunity to hear short readings from both authors and join a Q & A about writing and getting different types of romantic fiction published. Tickets are £3 available here ( http://www.biggreenbookshop.com/stuff-you-might-like-/ticket-for-a-romantic-evening-at-the-big-green-bookshop/prod_617.html ) and redeemable against the purchase of any books by either author. There's news of next month's Big Green Bookswap on our website too, which is a Local Author Special.